Good coffee is a necessity. 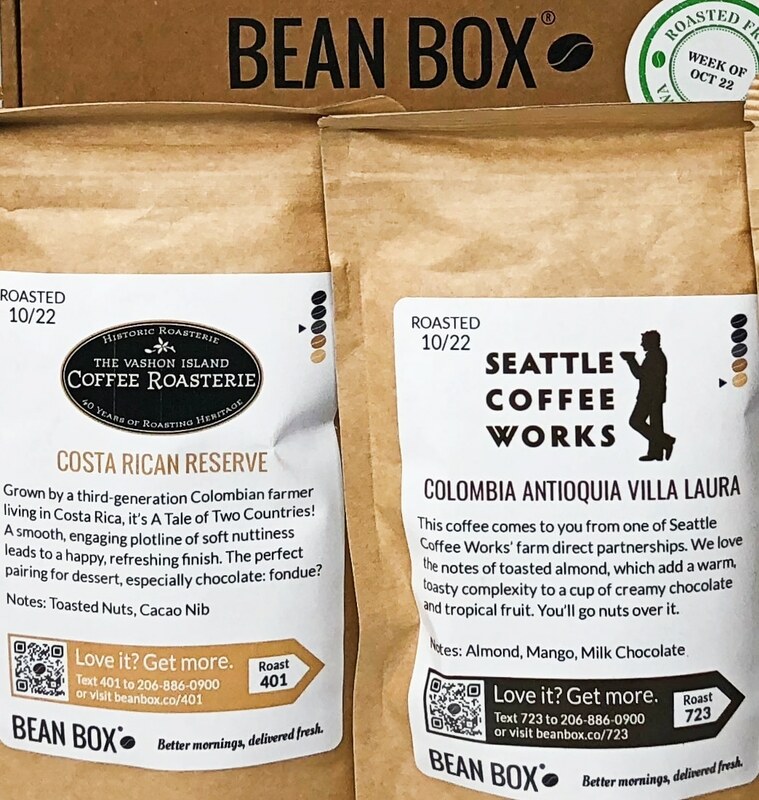 If you’re a coffee lover like me, you’ll love Bean Box! 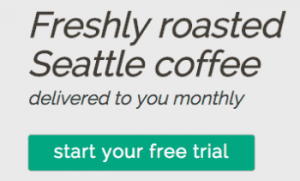 With this monthly subscription box, you can try new roasts and discover your dream coffee. 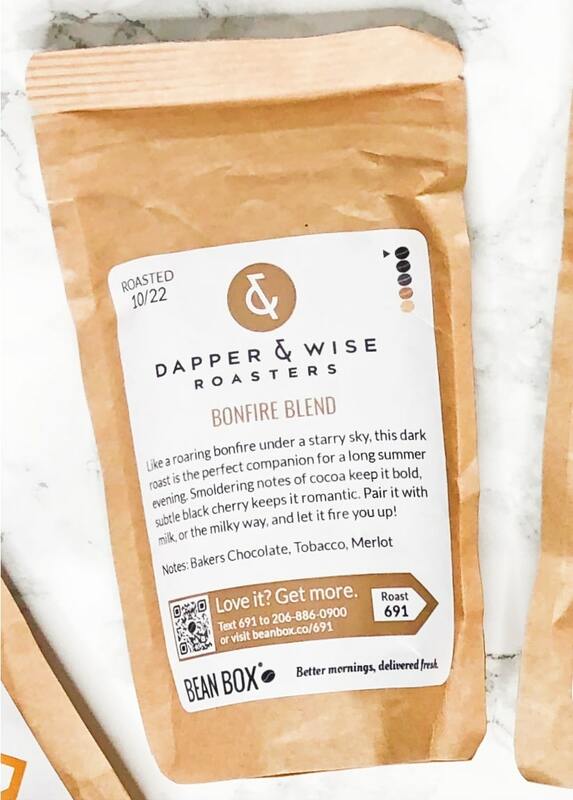 They offer two subscription options—one is a sampler box with four small bags (1.8 oz each) of coffee for $24 per month. The other is the coffee of the month that provides a full-size (12 oz) bag for $26 per month. Their coffee is sourced from the top roasteries in Seattle and Portland. This Bean Box review shares the coffees I received this month, similar coffee subscriptions, how to get your first box for $5 or less, and my overall thoughts about the subscription! As with previous months, I got the sampler box to try various new coffee roasts. My October Bean Box arrived at the very end of the month in one of their cute little mailer boxes. 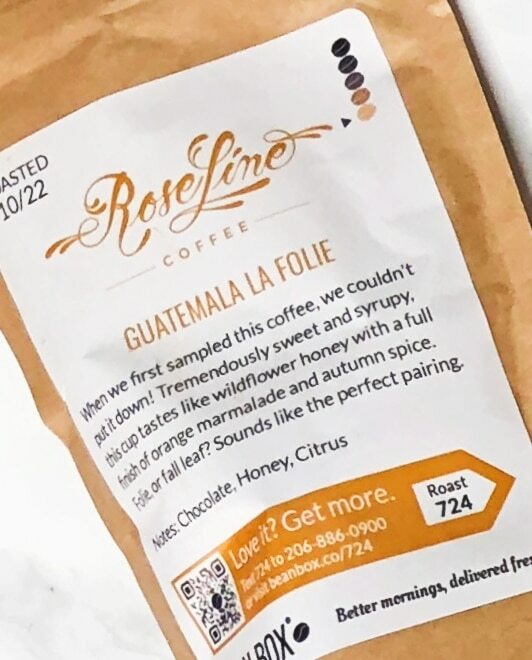 They place a roast date sticker on the front of the box so you know how fresh your coffee is! On the inside, the box has a pretty design of the Seattle skyline (which is where the company is based). My four sampler bags were tucked neatly under tissue paper, plus they included a yummy caramel candy to go along with them! There was also two coupo I’ll be reviewing each roast I received below. I typically prefer medium roasts, but some days I want a stronger taste. This one is perfect for those days! It’s one of the darkest tasting coffees I’ve ever tried. Since it’s so dark, I had to mix it with more milk than I normally would, but the final result was delicious. I don’t usually like tobacco notes, but they were very subtle, and I liked them when they weren’t so overpowering. In the past, I would’ve been disappointed that I received more than one light roast coffee to try out because I didn’t like them as much. I’m on a cold brew kick at the moment, though, so light roasts are the type of coffee I use most! This Guatemalan roast was absolutely amazing. It had tasting notes of honey with a little chocolate and citrus—my cold brew tasted better than normal with this roast. It’s a seasonal selection, so I’ll have to get one before it runs out! This medium roast was delicious. It’s a seasonal coffee that’s sourced from Costa Rica. Although it tasted a little lighter than most other medium roasts, I still really liked it. I was able to drink it without any milk or cream, which is rare for me! This is another light roast that I used to make cold brew. It was delicious as well, it had a slightly nutty, chocolate taste. It’s one of their best sellers and is sourced from Columbia. The full-size bag is fairly inexpensive compared to the others I got, so I might purchase this one! Bean Box has a generous deal for new subscribers! For one, you can get your first sampler box of ground coffee for just $5 including free shipping. They used to offer your first whole bean sampler box for free plus $3.99 shipping, but I don’t see it anymore. I’m not sure why they’d remove this deal, so I’d make sure to check on their website to see if it’s still available. In addition, you can use a referral link to get $5 off your first box! Since Bean Box is a bit spendy compared to the amount of coffee you get, you might prefer a coffee subscription that offers a better value. Luckily, there are plenty of coffee subscription options, and there’s bound to be one that fits your tastes. 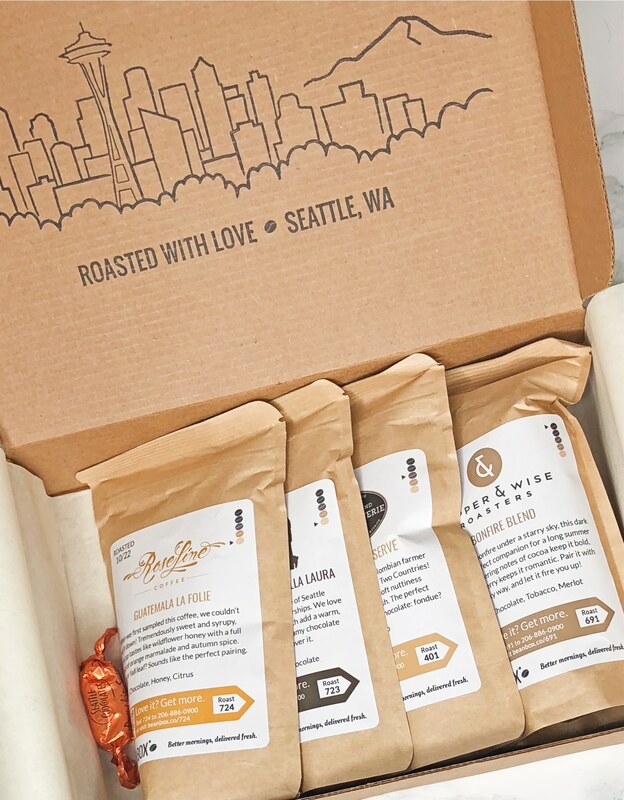 For one, many large coffee roasteries offer subscription boxes! These tend to be less expensive because you’re not paying the premium to sample various coffees like you are with Bean Box. One example that offers a generous $10 off your first subscription is Blue Bottle coffee! The 6 oz bag costs $8, a 12 oz bag is $18, two 12 oz bags are $33, or three 12 oz bags cost $47! Shipping costs an extra $5 as well. Many other popular coffee roasteries are following the trend and starting up their own subscriptions, so you might want to search your favorite to see if they offer one! All in all, Bean Box is a great subscription box for coffee connoisseurs. If you’re looking for your perfect coffee roast, this subscription will help you find it. The overall value isn’t great since you don’t get very much coffee, but that’s to be expected because you’re paying the premium to sample a variety of different roasts. Although I like their sampler boxes, I always love the coffees I get and can’t decide on just one. I’d rather try one full-size bag every month, so I’ll be switching to their coffee of the month subscription next month!